Synopsis: Dear Lucy Silchester, You have an appointment for Monday 27th July 2011. Yours sincerely Life. Lucy Silchester has received an appointment card. Actually, she's been invited along a few times to this appointment, but she keeps brushing the gold embossed envelope under the shag pile carpet. She's taken her eye off the ball and has busied herself with work (a job she doesn't love), helping out friends, fixing her car, feeding her cat, seeing her family and devoting her time to their life dramas. But Lucy is about to find out that this is one appointment that she can't miss. And she can't escape it either. Her Life is about to catch up with her in the most surreal of ways. One of the reasons I love Cecelia Ahern’s books so much is that they all have such clever, unique concepts. The Time of my Life was no different. What would happen if your life were a person? Someone who’s kept track of your every move your entire life - every friend, every kiss, every fight, every lie, every vacation. And then when you’ve screwed your life up, Life contacts you to make things right, because Life can’t be happy if you’re not happy. Brilliant. I loved Lucy. She made me mad at first - she was stubborn and selfish and lazy. But she learned so much, and she grew and changed in countless ways throughout the story. She became more thoughtful, started to really pay attention to the things she was doing and saying, and became a better person. The romance in the story was sweet, and although I’m a romance junkie, I appreciated that it wasn’t the main focus of the book. This was Lucy’s story first and foremost - her journey. But the initial ‘wrong number’ conversation she had with Don made me giggle and squee like a schoolgirl. I thought it was adorable and hilarious, and I enjoyed all their interactions. And, of course, then there was Life. He changed a lot throughout the story because of Lucy, but at the same time he remained constant. His whole purpose of being was to be Lucy's life, and he wanted what was best for her, and for her to be happy and productive and overall a good person. All the secondary characters were great, too. They were all so real, from Lucy's family to her neighbour to her friends to her ex-boyfriend to the "French" waiter in the restaurant Lucy and her friends frequented. Ahern has a real knack for making us feel like we truly know characters, even when we only see them a few times. Overall, I thought The Time of my Life was hilarious, thought provoking, and at times heartbreaking - a fantastic book that I thoroughly enjoyed. 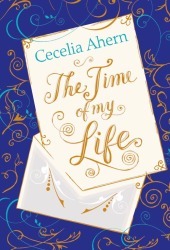 Have you read The Time of my Life, or any other Cecelia Ahern book? She's one of my favorite authors, but I hardly know anyone who's read her books. I'd love to hear your thoughts! Nope, I've never read that. You've definitely piqued my interest, though. That sounds like such an interesting and original concept for a book that I may have to get it and check it out. I've heard of capitalizing Life and thinking of it as an actual entity -- it's a common theme in the writings of Sarah Ban Breathnach. But I don't think I've ever seen it done in fiction to the extent you're describing before. Great review! Hi Marie. I know it was a while ago you posted this review but I wanted to reply anyway! I have read a few of Cecilia Ahern's books. I'm in the UK and I think she's maybe a bit more well known here. I've read PS..I love you, Where Rainbows End, If You Could See Me Now and A Place Called Here. I really enjoyed them all. I didn't realise she had quite so many more released that I've not heard of. Will have to take a look! Yeah.. I'd read most of her books except this one.